The Susquehannock Camps overlook beautiful Tripp Lake in the Endless Mountains of Northeastern Pennsylvania. Mild temperatures, low humidity, and 1200+ scenic acres of forested terrain provide the backdrop for the program. The grounds include multiple fields for soccer, football, lacrosse, field hockey, baseball, and softball. There are numerous courts for tennis, basketball, and street hockey, as well as two beach volleyball courts and two archery ranges. 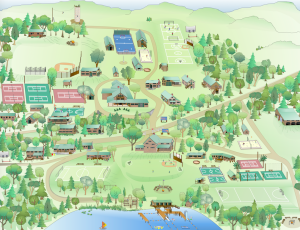 The main lodge serves as the campus dining hall where each camp eats its meals separately. The medical facilities include a fully staffed infirmary and both camps have separate shower facilities. All lake activities are enjoyed at Tripp Lake, a spring-fed, private lake right on camp property.